Hi Frugalistas! I’ll be the first to admit, I was always dubious about packing cubes. I saw them on websites, I saw them in luggage shops, but I always thought they were a bit of a gimmick. Another way to spend more money on travel accessories I didn’t need. Then I asked my blogger colleagues for their favorite packing tips. Travel blogger after travel blogger raved about packing cubes. I was curious, and decided I really needed to make up my own mind. There are almost as many packing cubes out there as there are suitcases and backpacks. Compression packing cubes, packing cubes with rigid sides, packing cubes with soft sides. I ended up buying soft sided packing cubes, largely because they were on sale. I figured if I didn’t like them at least I wouldn’t have wasted much money. I chose bright orange deliberately because they clashed brilliantly with my plum coloured suitcase – I was never going to leave them behind by accident. Next thing to consider when you choose your cubes is size. Make sure the size of the cubes you are buying will fit snuggly into your suitcase or backpack. If your suitcase/backpack brand also sells packing cubes, there’s a good chance they will fit – but still check your measurements. I bought three cubes that would fit together perfectly into my case – one large one and two small. I packed my “big” items into the larger of my cubes. I was amazed as more and more of my clothes went into that single cube. In fact, I managed to get all my pants, skirts, tops and knits into one cube. My underwear, guidebook and other odds and ends went into one of the smaller cubes. I ended up not using my second smaller cube. With my toilet bag packed, there was no room, and I actually didn’t need my third cube. My normal packing list seemed to fit even more easily into my bag with my packing cubes. My second pair of shoes and my electrical cords packed around the bags. I packed my suitcase with the bigger and heavier of my cubes so that it was at the bottom of the bag when my bag was standing up. While I love my suitcase, I’ve found that it does tend to tip over when I have a lot of gear in its front pockets. I was amazed that this problem disappeared when I used my packing cases. 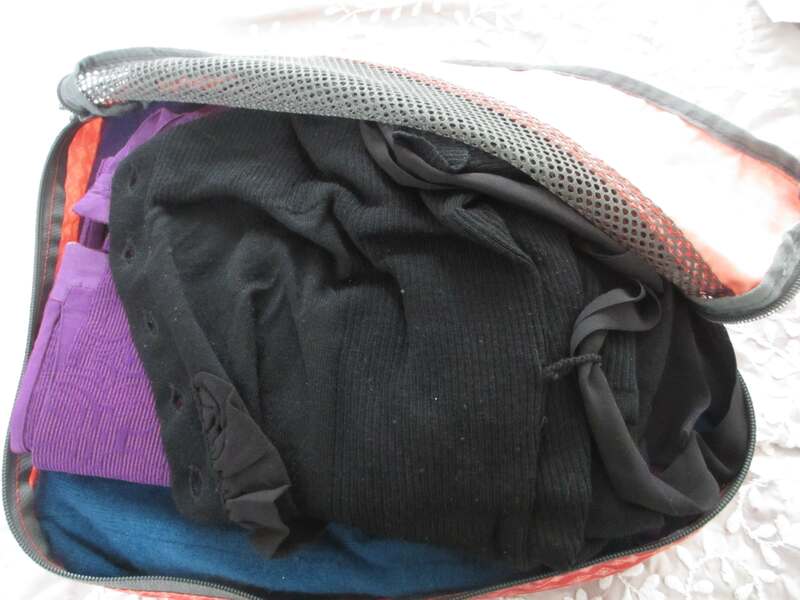 I loved my packing cubes, and they are now a “must pack” for me. By measuring before I purchased, they fitted perfectly into my suitcase. I was amazed at how much clothing fitted into a single cube. I loved how wrinkle-free my clothes remained. Having my underwear in a single small cube made it easy to find and keep track of my smalls. 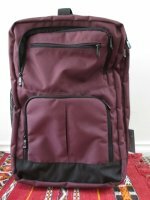 For Australian and New Zealand readers, I bought my packing cubes on special at Kathmandu (you can check out the Kathmandu range on this link.) Regardless of where you live I have thoroughly recommended packing cubes as part of your one carry on bag packing strategy. I’m sold! Wait till they are on sale – much, much cheaper! This is definitely the way to pack. My partner has a couple of these, and he’s always so much more able to unpack and repack easily and in a much more organised way than I am with everything just stuff into whatever little space it’ll fit! Great posting, thanks. We have a set of packing cubes from IKEA — bright pink! 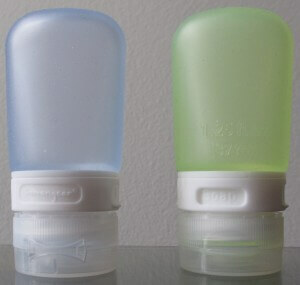 I agree, they keep our items organized; can’t miss the bright color when packing up for home. I didn’t know IKEA made them Lynne – another great discount option! Think we need to look into these, especially for our city break trips when hand luggage only is sometimes a requirement! I hate it when you open your case and it looks like an explosion has taken place even though you packed it nicely something has clearly happened in transit! That’s what I particularly loved Tam. – everything just stayed so NEAT! Thanks for the advice! I will definitely look into trying out some packing cubes for my next trip! I’ve been using the packing cubes for about 10 years. When I took my (then teenaged) boys to Europe for a 10 day trip, each one of us had our own color-coded cube to stuff socks and underwear. 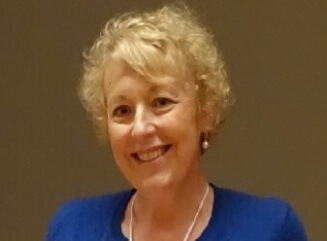 We each had one of the Packing Envelopes as well, which I use for my business clothes that don’t roll up well – suits, crisp linen or cotton blouses and the like. I’ve even packed silk formals into them. I have cube I keep packed with phone, computer, Kindle, and iPod chargers, that I leave in my primary suitcase. I travel a lot of overnight trips for business trips, and can toss this in my backpack, briefcase, or suitcase as needed. Great idea for helping keep kids organised Naomi. I also love the idea of keeping all your travel cords etc packed and ready to go – what a time saver! I love this idea as well! Mine did have a mesh insert, but I couldn’t see everything. Love the idea of using the plastic sleeves from sheets etc – another great budget option! 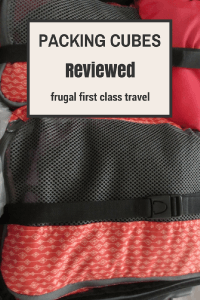 I bought 3 packing cubes about 5 months ago after reading Travel bloggers reviews. they weren´t cheap but they are very useful. i realiased that I no longer needed different sizes of suitcases. Almost all my trips could be done with my carry on suitcase. I now use them for every single trip. They are sooo useful. I can look mininmalist every though I have lots of clothes in my case. I have a Eagle Creek Pack-I Specter Folder for large items (jackets, dresses etc) a cube and a half cube. I’d never heard of packing cubes! I’m definitely going to look into them. Packing cubes are my favourite travel accessory EVER. I don’t know what I did before buying them! 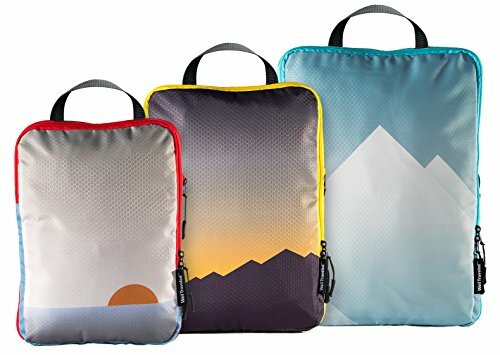 I’m on the hunt for packing cubes that also compress! That would be the ultimate! I do have to say that while I love cubes for traditional suitcases, I’m not such a fan for backpacks or soft sided travel bags. 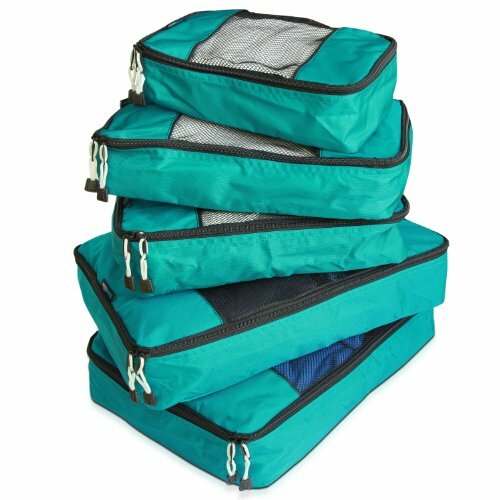 The square cubes make the best use of space in a square sided suitcase – in a curved backpack you get weird little gaps where the cube doesn’t meet the bag’s walls – a good nook, in theory, to stuff little things but that kinda defeats the purpose of being organized! So I use stuff sacks for my backpack travels. I have some from both Rick Steves and Ebags! Love, love, love them! A travel essential eversince I learned about them a few months ago! I’m using Dot&Dot from Amazon and was able to buy them while they were on sale; which made them very affordable 🙂 It made packing and organizing easier and it saved space in my luggage! I also use their packing folders to pack my business clothes to prevent wrinkles. Will never travel without them again! At first I thought these are ridiculous. But when I tried them, I never travel without them! It is so amazing how much I can put in one cube. I think I was able to put in 6 shirts on my small cube! For business meetings, I use packing folders together with the packing cubes. 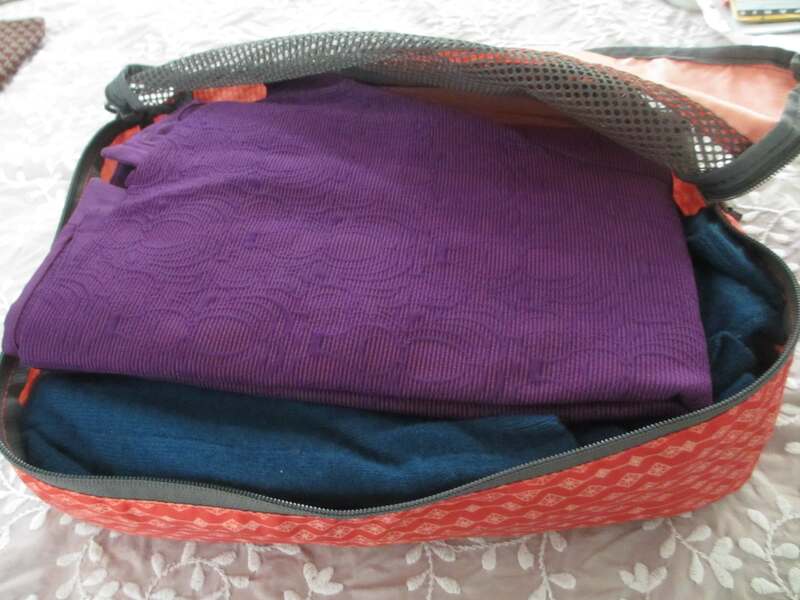 They are pretty much the same concept as packing cubes but with a folding board so your shirts are folded nicely and have less wrinkles. I use cubes when I have to carry extensive paperwork that interferes with the internal tie-downs in my bag. It’s important to note that some cubes are significantly heavier than others. It’s best to spend the money for the ones made out of sil-nylon. Stronger, lighter, water resistant. 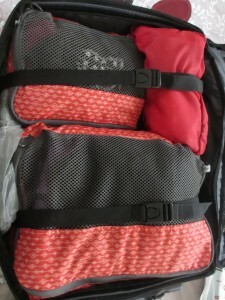 We have been traveling for the past two years, Packing cubes are something every traveler needs! It’s a must. They keep everything organized so you can find that item quick. They also keep everything contained so it’s not ending up at the bottom of your bag. 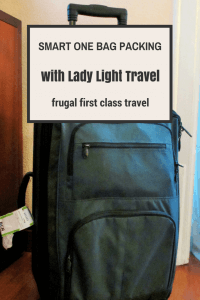 They are a must for travelers!